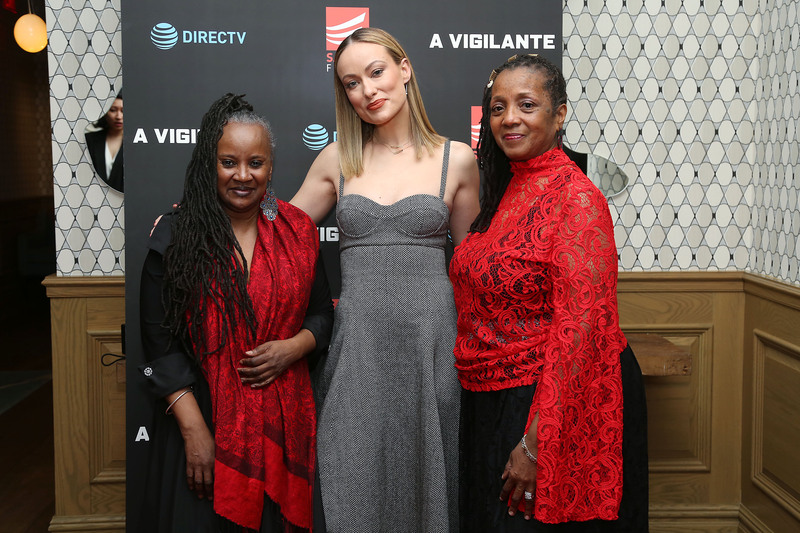 Above: star of A Vigilante Olivia Wilde with Henry Street team members Beverly Atkinson (left) and Theather Huggins (right). Wilde and the filmmakers consulted with Atkinson and Huggins on how to depict survivors’ support groups. Photo by Patrick Lewis/Starpix. Henry Street’s Domestic Violence Program team have always been our all-stars, but now they’re actually movie stars, cast in A Vigilante, a new film about domestic abuse, directed and written by Sarah Daggar-Nickson and starring Olivia Wilde. The main character Sadie’s experience of enduring violence was based on real accounts that Henry Street survivors shared with the filmmakers. To accurately portray the harrowing experience, Daggar-Nickson and Wilde visited the Domestic Violence Program and interviewed a number of survivors. They particularly consulted with Henry Street team members Beverly Atkinson and Theather Huggins on how to depict survivors’ support groups. The film’s support group counselor is named for Beverly! 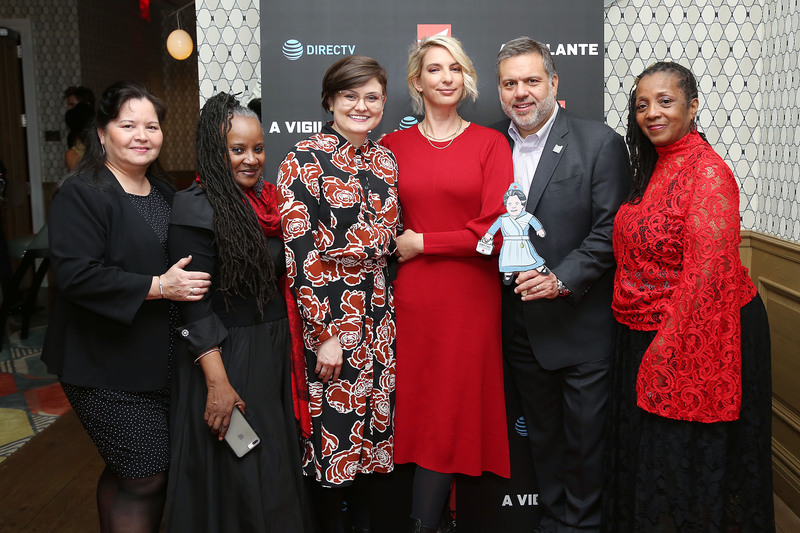 Above: Writer and director Sarah Daggar-Nickson (third from right) with Henry Street team members Maria Perez, Beverly Atkinson, Nicole Lee, Executive Director David Garza, and Theather Huggins—and Flat Lillian. Photo by Patrick Lewis/Starpix. Estefania Tejada and Ebony Hilaire, former clients of Henry Street’s program, also appear in the film. A Vigilante shines a light on a subject little addressed in film and demonstrates the strength it takes to both survive and leave such circumstances. Daggar-Nickson discussed Henry Street’s programming for survivors and the organization’s involvement in the film at a special screening to benefit Henry Street on April 2, 2019. At the event, Huggins, a domestic violence survivor herself, detailed how she arrived at Henry Street’s Domestic Violence Program. Henry Street not only opened its doors to her and her three young children, she said, but also invested in their futures, enabling them to move forward successfully through higher education and job placement. Huggins said that, without Henry Street’s support after such a traumatic experience, she would not have imagined her and her family’s lives as attainable. Olivia Wilde reminded the audience that the gathering was intended to recognize the courageous strength of survivors of domestic abuse and the significance of organizations like Henry Street Settlement. She introduced David Garza, Henry Street executive director, who encouraged the audience to become engaged with the mission, whether through volunteering or donations. Then she made the first donation! Above: Olivia Wilde and David Garza address attendees at special screening of A Vigilante to benefit Henry Street on April 2, 2019. Photo by Patrick Lewis/Starpix. Other celebrities in attendance at the screening included Kelli Barrett, Bobby Cannavale, Charlbi Dean, Trieste Kelly Dunn, Beanie Feldstein, Amy Heckerling, Vanessa Ray, Kiernan Shipka, Christine Spang, Alison Wright, and Tara Westwood. To support the Henry Street Domestic Violence Program, please go to henrystreet.org/supportsurvivors.